Observation - Great Diving Beetle in frozen pond - UK and Ireland. Description: Great Diving Beetle one of three caught when children from Meadowgate School were dipping on an ice covered Surrey pond. 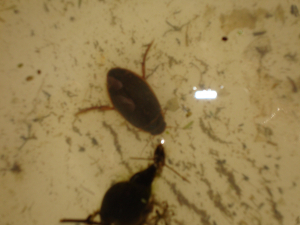 Great Diving Beetle one of three caught when children from Meadowgate School were dipping on an ice covered Surrey pond.